These socks were started over a year ago on a trip to Connecticut. I finished them fairly quickly, aside from the afterthought heels, which stumped me because I couldn’t figure out the right yarn. I didn’t want the yellow/green or the dark blue…. son they hibernated for ages. On my way out the door to knit night this week, I grabbed some red leftover sock yarn, and asked my friends what they thought. The consensus was that the red would be awesome, so I went for it, and two days later, I had finished socks. Finished (a while ago) and blocked (a few days ago)! I feel like this is one of the most amazing things I’ve ever knitted- I tend to knit simpler items, but this had a lot going on- color changes, garter Stitch, cables, eyelets, I-cord, picot thingies! It’s crazy bright and fun, and I’m looking forward to its public debut at Stitches West tomorrow! I hope to get a photo with Steven Be, who helped me choose the yarns at his booth last year. And I may see some of you there as well! Happy knitting! PS I just realized that in my modeled photos, I wore the shawl inside out, and the picot thingies don’t show up! Big oops! Well, blogging is a different world now that I’m working full-time. Thanks to commuting by bus about half of the time, I’m still managing to get plenty of knitting in, even if it doesn’t seem like it. My Reyna Shawl is finally finished, blocked, edging undone and redone, and re-blocked! This yarn, Plucky Feet, isn’t all that soft, but it’s resilient and squishy, and the resulting shawl should wear well. I also have a few bears to show, bears 101 and 102. And Yeti bear! My son called this one a zombie bear; maybe the neon green wasn’t the best choice. I only have one bear left in my Dr. Who-themed alphabet. Next up will be Literary Bears! I already have my A-Z list completed, but might change it up as I see fit. You know those projects that have been in your Ravelry queue for years and you might never actually get around to makng them? Well! I finally got around to such a project! 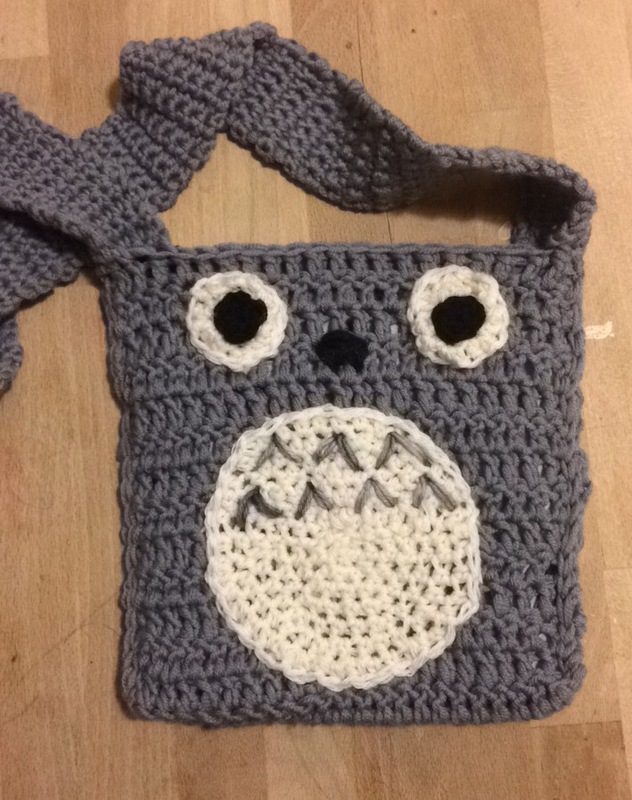 I’ve wanted this Totoro bag for ages, and I actually don’t know what was holding me back, aside from the fact that crochet can hurt my wrist…. 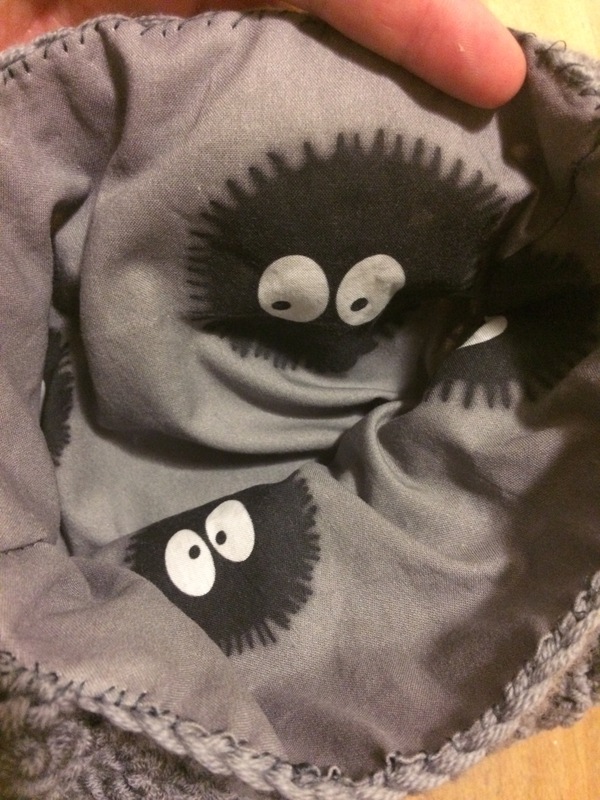 I found the soot sprite fabric on Spoonflower. I thought the susuwatari would be smaller, but since it’s just the lining, it’s ok. I didn’t line the strap, but after wearing it for a few minutes with my phone inside, I think I’d better. It stretches out quite a bit! The bag is supposed to have Totoro with ears, but I think he looks ok as is. Opinions?